As an alternative to a traditional agenda, use a large visual template to capture the process and the ideas of the day. 5. Identifying common the success factors of those solutions. Over the course of the day, small groups formed and reformed against each of these activities. A graphic recorder captured highlights from the discussions as they are shared back to the large group. A graphic facilitator guided the group through the process of assessing value drivers and selecting the top five. Facilitating against one large visual template has several advantages. Participants can better understand the expected outcome for each activity if they know how it fits into the bigger picture. They can anticipate and better prepare for the next step. It’s easier to trace the provenance and progression of an idea, and consequently, to expose, validate, or challenge assumptions. As the template is populated, it serves as a visual check on the day’s progress. As with all visual methods, it gives the ideas more permanence and makes them easier to recall. Most importantly, the template makes the decision making process more transparent by unpacking it from the typical black box of participants’ heads. If I said, "Meet me in Paris" and that's all the information you had, where would you meet me? Ask this question to any group, and you'll get a variety of answers. "I wouldn't meet you... not enough information!" Of course, the answer you'll hear more than any other is the Eiffel Tower. Ask the group why they offered the answers they did. "I said the Louvre because it's personally significant, and if you knew me, you'd know that." "I said the Arc de Triomphe because it's central and easy to find." "I said Charles de Gaulle Airport because it's easy to get to." "I said Paris Texas because I was thinking outside the box." "I said I wouldn't meet you because I don't know exactly where, when, or why, and plane tickets are expensive." And: "I said the Eiffel Tower because it's the most obvious." Nearly every group decision-making process has some element of clustering small ideas and grouping them into larger categories. When designing a vision map, this happens when identifying themes. It can be one of the most difficult processes to facilitate if the group can't agree on those themes. It marks a turning point from OPENING to REFINING, and shifting from one thinking mode to another isn't easy. The Principle of Meet Me In Paris. * The Eiffel Tower is correct, not because it's meaningful to a few people, or easy to get to, or the most creative answer, but because it's the one that most people would guess. Themes serve as a framework for understanding the ideas inside them. When your purpose is to communicate clearly, the goal is to be readily obvious to the largest audience. The framework of themes should be transparent and as easy to understand as possible. The Principle of Cleaning the Garage. Return to the Principle of Cleaning the Garage. What if someone ELSE had to understand the way you're organizing your garage? Could they find what they were looking for with no guidance from you? How would that requirement influence the way that you're organizing the content? The Principle of the Cherry Pie. Think of the content as a cherry pie. We have to slice it up to make it easier to serve out. We could slice it radially (like nearly all pies.) Or we could slice it into squares. Or we could slice it into strips. But what we can't do is slice it one way, then another, then another... or we wind up with cherry soup. Pick one framework and stick to it, unless there's a very compelling reason to do something different. The themes are not nearly as important as the content that's in them, but deciding on them can be a major source of disagreement for groups. Having these principles readily available is a way to help groups navigate through the hairpin turn from OPENING to REFINING. Hint: In identifying themes, groups can often confuse the WHAT of an idea with HOW it will be achieved. For example, if an idea is "Survey Customer Opinion," the larger WHAT theme it falls into may be "Gain Customer Understanding," whereas the HOW is "Marketing Department." Several HOWS will usually cross-cut several ideas, creating many-to-many relationships and undermining the purpose of categorizing. For example, "Survey Customer Opinion" could be done through Marketing or IT or Sales or Customer Service.... and probably should be involve all four in some measure. Group ideas by WHAT you're trying to achieve, not HOW you'll achieve it. *I first heard the Principle of Meet Me In Paris from Professor Steve Nowlis at Arizona State University in 2005. Vision maps describe complex future states, current operating environments, or plans or proposals on a single placemat-sized sheet of paper. Data is gathered from existing source documents like strategic plans, facilitated team meetings, and stakeholder interviews. Content is organized using a technique called “visual triage” for sifting and binning similar themes. Themes are then linked into a single cohesive story. A visual is then designed around that story. Vision maps synthesizes or replaces lengthy documents and invites communication between the presenter and audience. 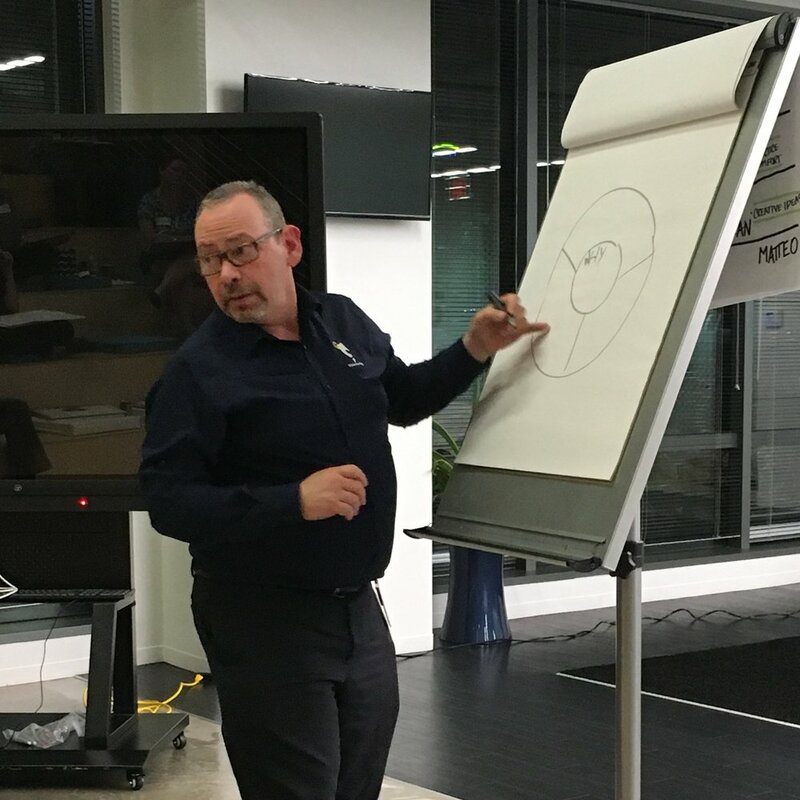 Click here to learn more about workshops including our See Your Ideas vision map class, or click here to request a training. Human beings are good at seeing things that aren't really there. This is helpful when a job requires finding connections and patterns. Once you've gathered a critical mass of content and data for a vision map, it's time to put the participants' ability to find those connections to work. Here's how to set it up. "If you had to clean your garage, you might start by dumping everything out on the driveway and figuring out what goes together. You'd probably start by deciding what you want to keep and what you want to get rid of. Then, you COULD organize all your stuff by use. For example, all your sports equipment goes together, your gardening stuff goes together, your tools go together, and so on. Or, you might organize your stuff by shape. All your long handled stuff goes together, so you'd put rakes and baseball bats and brooms together, and all the stuff in boxes stacked neatly. HOW you organize it doesn't really matter, so long as it makes sense to the most number of people who have to find things. We're going to recreate that process here. "First, start by scanning all the content we've gathered. If something strikes you as worth keeping, highlight it. Now, 'worth keeping' is subjective and means different things to different people. Rather than come to one definition of what 'worth keeping' means, we're going to leverage the diversity of perspectives in the room and say that if it's worth keeping for one person, it's worth keeping for the group. That way, we'll start to see all sides of the beachball. "After a while, you'll start to see themes emerge. Themes are the big categories of information that our content falls into. If you think you see a theme across the content, move those pieces of content together, and write down the name of the theme on a sticky notes near the cluster of content. Talk with your colleagues about this. Have a discussion. Validate your proposal for a theme with others. And remember: what matters most is that the themes make sense to the most people. Keep the Paris Principle in mind." The Mid-Atlantic Facilitators' Network practices Identifying Themes. Once, I was working with a design team to create a first version of a vision map under a tight deadline. After we gathered the content we needed, the team took a break while I sketched out six thumbnail concepts to layout the content. Going off of what I assumed about the design team, my first five thumbnails were traditional and businessy, all arrows and boxes. With about a minute before the team came back from break and out of ideas, I drew a mountaintop, with content laid out on the summit, hiking trails, ski slopes, and surrounding clouds. I thought there was no way the design team would go for it. Surprise: the team loved the mountaintop layout. After gathering content, sketching six thumbnails concept drawings is your next step in designing a vision map. The first few thumbnails will capture the most obvious ideas. It may feel like a stretch to come up with the last few thumbnails, but real creativity often shows up once the obvious ideas are out of the way. Share your thumbnails with the core design team to get their feedback and decide on the overall look of the vision map. Use what you know about shape, layout, metaphor, and visual vocabulary to come up with ideas for the six thumbnails. A collection of videos of workflows for designing a vision map. More to follow! Instructions for how to incorporate hand-drawn images into Illustrator. Workflow that includes a digital template that's traced by hand and scanned back into Illustrator to achieve a hand-drawn look. High-level overview of the entire approach to vision mapping. What is a Vision Map? In preparation for two upcoming courses on how to design Vision Maps, we designed this explainer video using Google TiltBrush VR. Thanks to Heather Martinez, Trent Wakenight, and Ben Tinker for fantastic feedback! 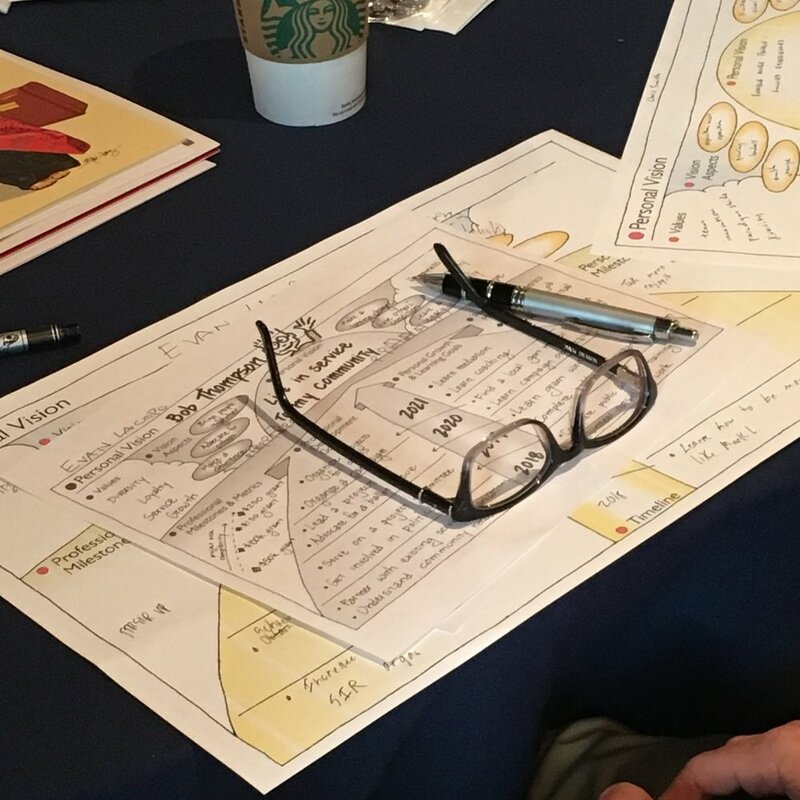 A vision map can serve as a powerful tool for stakeholder engagement and buy in. Schedule a working session to review the vision map with a small selection of your key stakeholders. Prepare by printing the latest version of the vision map on 11x17 placemat-sized paper, one for each participant, and a single wall-sized version. Introduce the vision map to the group by saying, "A few of us got together and sketched out some ideas. This is the way we see it. We're not saying it's the only way to look at this, but it's what we came up with, and we're sharing it with you to hear what you think about it." Resist the temptation to present it as a well-polished, complete deliverable. Most of your stakeholders will be seeing this for the first time, and they will feel intimidated and pressured to provide insightful feedback in a few minutes while others have had hours or days refining their ideas. This isn’t the time to impress your stakeholders by how much time and thought you’ve put into the project, or how much knowledge and experience you bring to it, or what creative solutions you’ve thought of. Be authentic as you ask for their help and insight. After your stakeholders have time to read, solicit their feedback. You could choose a structured model for feedback, such as I Like I Wish What If, or One Breath Feedback, or One Word Feedback, but it’s best to have an open, facilitated discussion. Make sure every participant is given air time to avoid spending too much time on one aspect of the vision map. 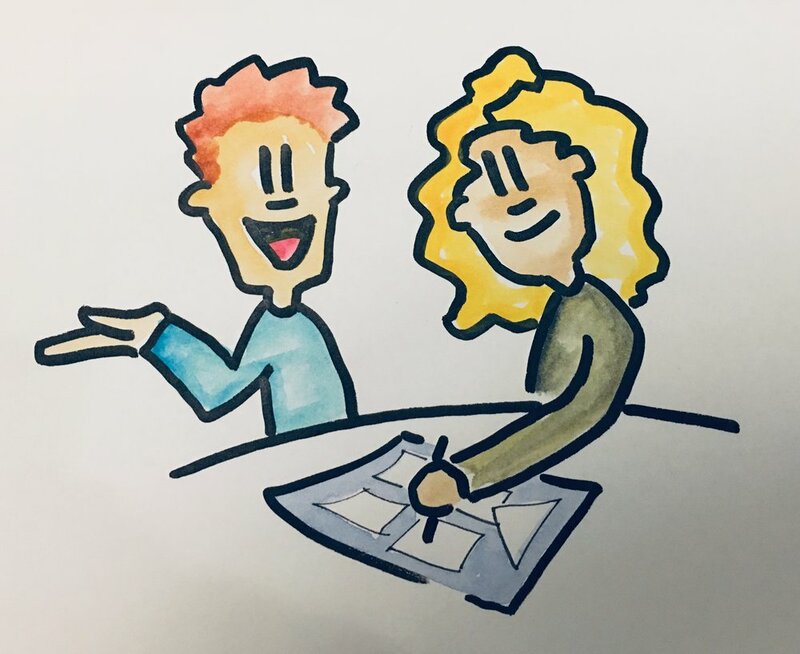 Capture the feedback using a combination of graphic recording and direct edits on a version of the vision map large enough for everyone in the room to see. Have a note-taker on hand to capture the discussions between stakeholders. These notes can serve as raw material for more detailed content for the vision map. Remind yourself that the feedback your stakeholders share is coming from the perspective of their fresh eyes. You have been in the thick of designing and refining the vision map, and it’s easy to lose perspective while working the details. Trust that what you hear is the honest opinion of those who are sharing it. Thank your stakeholders for their feedback. At all costs, resist the urge to explain or defend. Just make note of what you hear. After the feedback session, meet with your core design team and discuss what you captured, point by point. THIS is the time to go into detail. Decide among yourselves how to incorporate the feedback you received. This may be in the form of edits to the vision map, or in depth discussions with the individual who offered the feedback to better understand their perspective, or in the scope of the vision map overall. 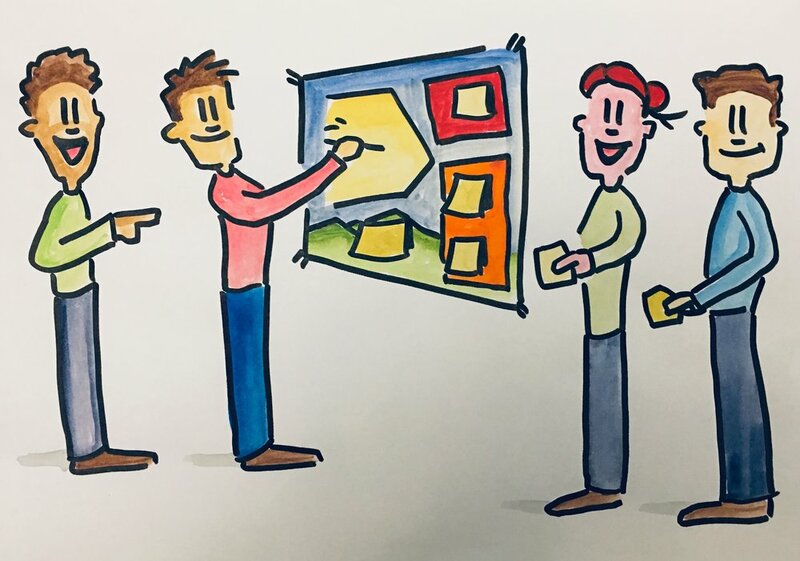 When the next version of the vision map is ready, invite a larger selection of your stakeholders to another feedback session, as well as the original group. They’ll see that their voices were heard, as they see their words reflected in the next version of the vision map. As they see themselves as helping to shape the vision for the future, they’ll be more engaged in the changes to come. Wash, rinse, and repeat the process. Here's a neat idea for both visual templates and vision maps: use the shape of words to create objects and elements. Visual template to harvest what's working, what's not working, and solutions to advance both. On the topic of Visual Templates, Bas Bakker just released a free ebook with 99 visual templates AND ideas for how to design others. They're simple, "one function" templates that you can draw with a moment's notice and use to facilitate a discussion. Good stuff in here! Advice from Tiffany Forner of the Grove Consultants on storymapping. "I’ve worked on many Grove Storymap® projects during my 18 years at The Grove. In the beginning, it felt like wading through a swamp of data, struggling to find a way to communicate a client’s complex situation in a clear and simple way. This kind of information design was not like anything I learned as a design major in college. "After years of practice and collaboration with my esteemed colleagues, Laurie Durnell and Rachel Smith among others, it has gotten easier. Below is a summary of some things I have learned." Here's a method to get a handdrawn vision map with the precision of a digital design. Sharing the bottom line up front (BLUF) isn't always a best practice. Participants may have zero context around the issue you're about to share. Especially when you have a lot of information to share, it may be tempting to jump into the "need to know" info. An ounce of framing a conversation properly is worth a pound of trying to convince someone who's not ready to listen. Context, purpose, and WHY THIS MATTERS is everything. With text-heavy presentations, borrow a page from Edward Tufte, who said, "People read four or five times faster than you talk. Rather than reading your audience the text of your PowerPoint, write a paper, print it, hand it out, and say, 'Take a few minutes, read this, then we'll have a discussion.'" The first time you do it, the silence may feel awkward, but that evaporates quick when people get into the reading. One thing I do is to ask people to simply make eye contact with me once they're done reading so I know they're finished. - It can be easily explained...would your next-door neighbor get it? RESULT: The teams start thinking about how to apply their strengths to get there. Robert Mayer on MultiMedia Learning Theory.